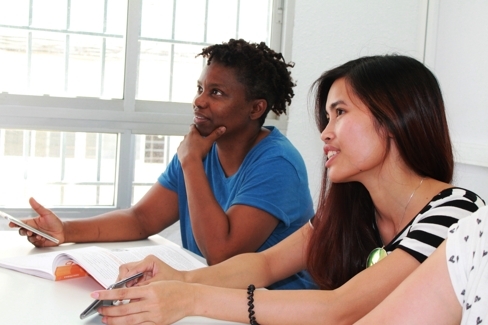 AIL Malaga is a small school offering high-quality Spanish courses in Spain in a friendly and fun environment: there’s no better way to learn Spanish than with our intensive Spanish courses in Malaga. The top Spanish language school in Malaga, we are the sister school of AIL Madrid, an academy accredited by the Cervantes Institute. All of our courses are based on innovative techniques aiming to improve communicative abilities quickly, for everyone from complete beginners to more proficient students. 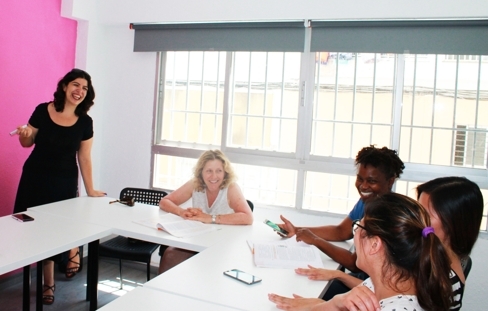 With AIL Malaga, the learning process is made all the more efficient and personal thanks to our focus on small and intimate groups, with an average of 4 students in each. These small group sizes mean that every single one of our students receives personalised attention from their teacher and all team members. We do everything we can to provide Spanish courses in a warm and friendly environment, so that our students will feel at home with us. As a result of our modern and attentive teaching methods, at the end of your Spanish course you will be able to speak Spanish in your day-to-day, academic and professional life. Are you going to miss out on this amazing opportunity to learn Spanish in Malaga? Our Spanish language school is located in the west of Malaga, in the iconic Costa del Sol with some of the finest beaches in Europe. It’s as authentic a neighborhood as you could wish for, and ideal for anyone looking to immerse themselves in the daily rhythms of Andalusian life. It’s an area of narrow streets, packed with local shops and bars, and full of real Malagueños eating and drinking the local delights. Visit a neighborhood market, and relax with a glass of Malaga wine as you sample some of the delicious fried fish (pescaíto) that makes this coast famous throughout Spain. It’s as pleasant a way to soak up the culture as you can imagine! AIL Malaga is in the heart of the neighborhood. The “Parque del Oeste” is just a 10-minute walk away, and a great place to wander and observe as the locals go about that quintessential Spanish habit of the daily stroll whilst the more energetic play endless games of football or basketball on the many public courts. If it’s a warm sunny day, and it usually is, you can head for the largest beach in Malaga, just a 10 minute walk from the school. And of course you’ll want to explore the rest of this extremely fascinating city with its staggering wealth of monuments, museums, shops, and restaurants. The metro is just 200 metres away and will give you easy access to all that Malaga has to offer within less than 20 minutes. And when it’s finally time to leave, the nearby mainline train will get you to the airport in no time at all. Come and join us and experience the real Malaga! Learning Spanish in Malaga offers you the chance to have an unforgettable experience: high-quality intensive Spanish courses in Malaga, beautiful accommodation near the school, and fun activities where you can make lots of friends whilst learning about the Spanish way of life. Recently proclaimed the Spanish city with the best quality of life, and full of history and culture at every twist and turn, Malaga is undoubtedly a must-vist city: but learning Spanish here will take your experience in the capital of the Costa del Sol to the next level. If you are looking to have a great time, absorb Spanish culture and truly enjoy yourself while seeing remarkable improvements in your Spanish… this is the Spanish language school for you! Our Spanish courses are designed for you to spend most of your time learning Spanish in Spain, this is why we developed dynamic and interactive Spanish Intensive Courses. This will enable you to learn Spanish as fast as possible. The groups size are probably the smallest in Malaga (average of 4 students) and you will have all the attention of your teacher and the support of your classmates. Having the smallest groups of Malaga doesn’t mean that you will not meet a lot of people. During the breaks and activities, you will have the chance to practice your Spanish, share your adventure with other people and make friends from all over the world. The prices of our Spanish courses and accommodation in Spain are extremely competitive options. Our school aims for the highest possible quality Spanish lessons for all levels from absolute beginners onwards, with dynamic native teachers and in modern facilities. Our outstanding location a few metres from the beach adds another dimension to our excellent quality-price ratio. If you want to learn Spanish abroad, we are the fun and student-focused way forward in Malaga!